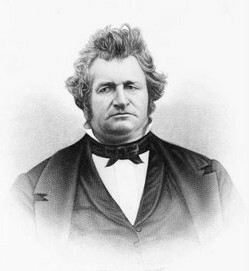 Joseph Goodrich came to Wisconsin from Allegany County, New York, in the summer of 1838, and selected the site of Milton for a settlement. It was his idea that a school be opened to provide a more advanced education than that offered by the few common schools in the area which were usually held only three months of the year in private homes. 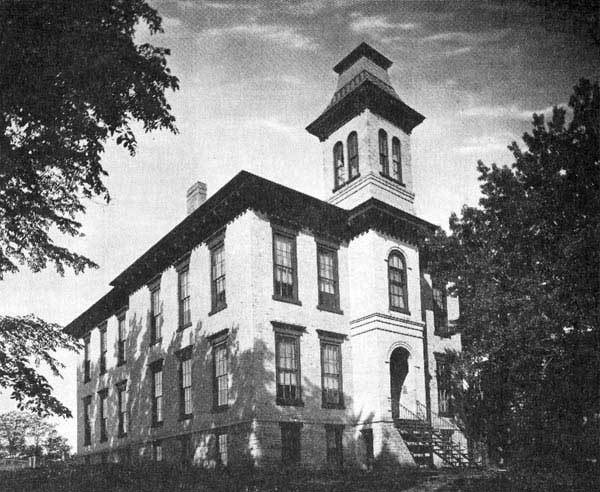 Instruction in the school was designed almost exclusively to aid young men in preparing for business pursuits and to prepare young men and women for teaching in the public schools. Every advantage offered to young men was also offered to young ladies, and they recited in the same classes. It was thought that a school of this kind would attract families to settle in the vicinity. 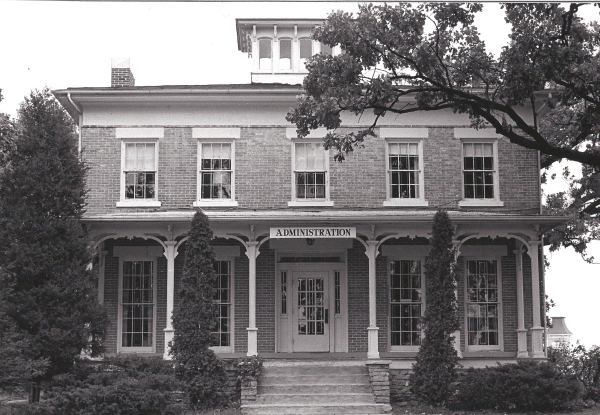 The academy building was built in 1844 near the north-west corner of the public square when there were only four dwellings in the village. Construction cost was about $300, and was paid for by Joseph Goodrich, who managed the school and bore its expense in its first years. The Academy opened as a select school at the beginning of December 1844, with the Rev. 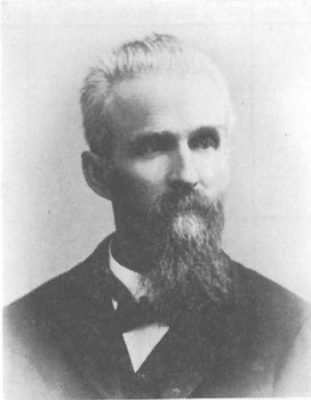 Bethuel C. Church as its first teacher. He paid no rent for the building, and he retained all tuition income. Samuel S. Child succeeded him for a short time, and then the Rev. S. S. Bicknell was engaged as principal. It was he who, in the spring of 1847, issued the first catalog. Tuition was $3.00 per term of 11 weeks, of which there were three a year. Board in private homes was $1 to $1.50 per week. There were 67 students, 40 gentlemen and 27 ladies. The success of the Academy had proved its worth to the community, and in the winter of 1847-48 a group of citizens combined to secure a charter for the school, placing it under the control of a board of trustees. It was named "The Du Lac Academy, a name that was never popular, nor used beyond the charter and the correspondence of the officers of the school." Shares of stock were $5 each; instruction was not to be given, nor meetings of the corporation held on either the seventh or the first day; the trustees met individually the deficits of the school for teacher's wages. The building was engaged by the trustees from Joseph Goodrich without rent if they hired a college graduate as principal. From the opening of the fall term of 1851, A.C. Spicer, with the assistance of his wife, Mrs. Susanna M. Spicer, had supervision of the Academy for most of seven years. Their compensation was derived entirely from tuition fees. The old grout academy building became untenable, and classes met in a private house. For want of suitable accommodations, school was suspended for two-thirds of the 1853 school-year. 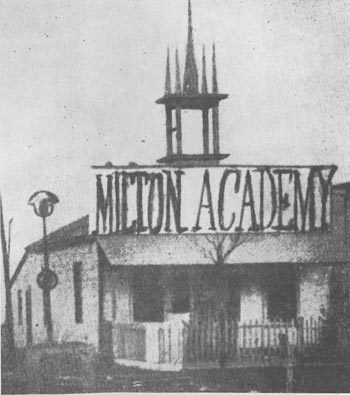 A new interest in the school led to a larger association of persons and a new charter was obtained from the legislature in March of 1854, naming the institution “The Milton Academy.” The school was reorganized in the spring of that year under the Spicers. 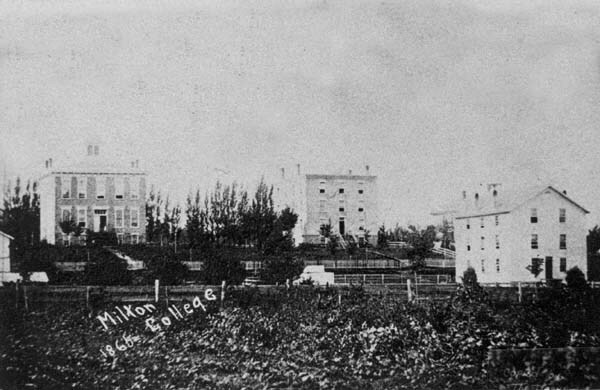 Classes were held in private residences until the fall of 1855 when the “beautiful and commodious building of Milwaukee pressed brick” was ready for use. It was 40 feet by 44 feet, three stories high, and cost “something over $4,000,” and was paid for largely by the subscriptions of the stockholders of the Academy. "In the summer and fall of 1857, the need of another building for dormitory purposes being greatly felt, the trustees authorized Hon. Joseph Goodrich and Hon. Jeremiah Davis . . . to erect one" for fifty students. Its cost was nearly $5,000, and was finished by the beginning of the winter term 1857. "at that time, and for the five years following, the dormitory was rented to both lady and gentleman students; the ladies occupying the third and fourth floors, the gentlemen the second and the basement floors." --Historical Sketches of Milton College, W. C. Whitford 1876 and A. Whitford 1916. In 1866, President Whitford obtained permission from the trustees to raise funds for an addition to the south side of the Academy [Main] Hall and the tower at the north end, which together cost about $10,000. The work was completed in 1867. About the same time, realizing that the high school and state normal school systems then developing would leave but a small demand for private academies, President Whitford felt that the stockholders of the Academy would be justified in seeking a college charter. The charter was granted by the state legislature in February 1867 and was formally accepted by the stockholders on March 13 of that year. The library and reading room in Main Hall. A donation of $1,000 from the Rev. 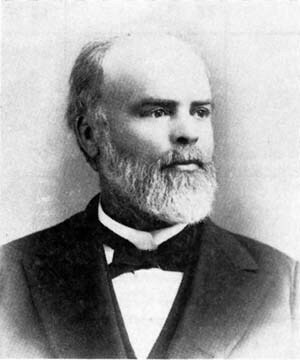 Daniel Babcock enabled the college to establish the “Daniel Babcock Library” in 1871. 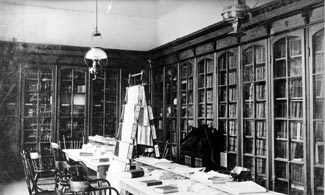 The library and reading room were at Main Hall until Whitford Memorial Hall was built, at which time the library took over the north half of the first floor of that building. New York, Jan. 5, 1907. Yours of December 29th received. Mr. Carnegie notes that you are erecting a Science Hall, also to contain a library and other accommodations, at the cost of $23,500, of which you have succeded in raising all but $6,500. Mr. Carnegie will be glad to donate this sum to the college, so that it will have this building free from debt. His cashier will send you the amount at an early date. Published in the Janesville Gazette on January 9, 1907. 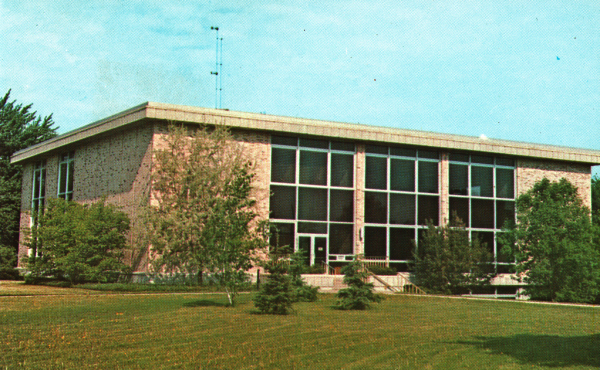 The Shaw Memorial Library was dedicated in 1967. Miss Mabel Maxson, great-granddaughter of Daniel Babcock, graduated from Milton College in 1911 and received a Master’s degree from the University of Wisconsin in 1912. 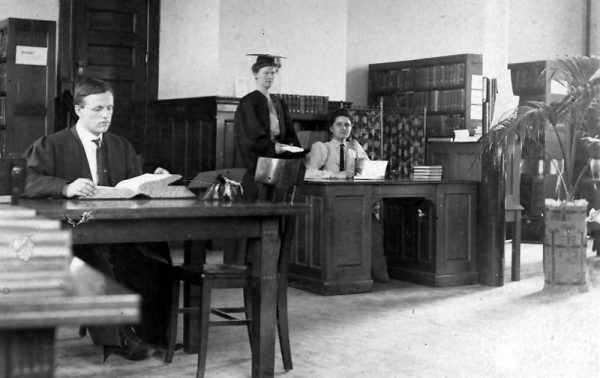 She joined the faculty in 1912 as librarian and Professor of English, retiring in 1955. 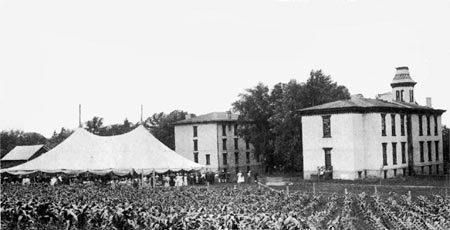 Before there was an auditorium-gymnasium, a tent was sent up each June for the commencement exercises and other programs of Commencement Week, including the Shakespearean play. Graduates process to the Percy L. Dunn Athletic Center. President Whitford, realizing the need for a science building, obtained permission from the Board of Trustees at their annual meeting in July 1901 to seek funds for construction of such a building. 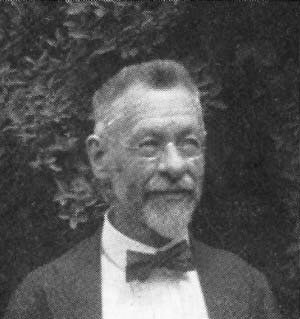 His efforts were cut short by his sudden death in May, 1902. 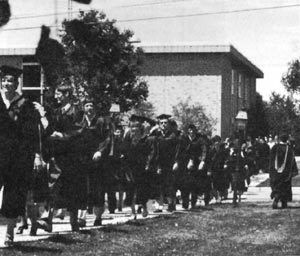 During the commencement exercises of that year, it was proposed a science hall on the spot where the commencement tent stood would be a fitting memorial to President Whitford. The proposition was approved by the alumni, money was raised and the cornerstone was laid in June 1904. 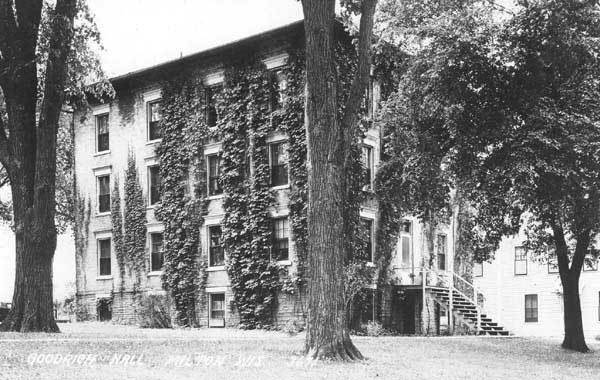 The building was completed in the fall of 1906 and dedicated at commencement exercises in 1907. The Rev. William C. Whitford, then pastor of the Milton Seventh Day Baptist Church, was persuaded to assume the position of principal of Milton Academy in 1858. He served as principal and then as president of Milton College until his death in 1902. During these 44 years he was for one year a member of the Wisconsin legislature, for four years State Superintendent of Public Instruction and for nine years a member of the state Board of Regents of the normal schools. President, William C. Daland was born in New York City in 1860 and at an early age showed a talent for music which he shared with others all his life. At age 14 he became a church organist and following his graduation from Brooklyn Technical Institute in 1897 he taught music for several years. In 1883 he embarked on studies for the ministry, graduating from Union Theological Seminary fo New York in 1886. He served as pastor of the Seventh Day Baptist churches in Leonardsville, N.Y., Westerly, R. I. and London, England, before accepting the presidency of Milton College in 1902. President Daland reorganized the curriculum, built up the English department and took personal charge of the linguistic courses in English. He organized the college symphony orchestra and gave many recitals and concerts in Milton and nearby communities. For 12 years he was Secretary of the Association of Presidents and Deans of Wisconsin Colleges and with other college presidents of the state helped form the Wisconsin Colleges Association which raised money toward maintenance of the colleges. He died in 1921. 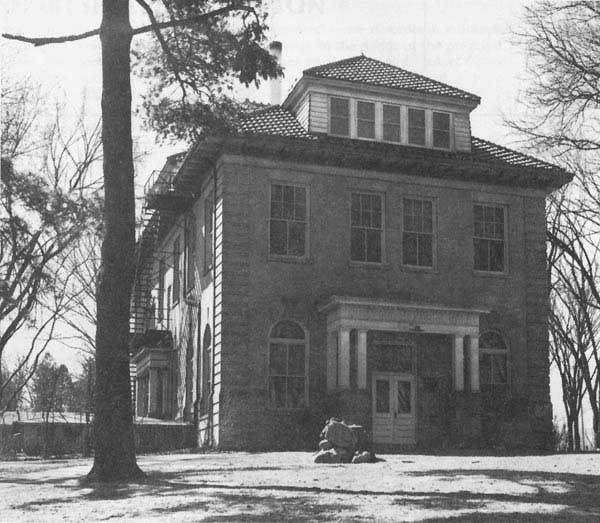 The home purchased for President Daland and his family in 1902 was later known as “the Studio” where the School of Music was located, “fortunately, far enough removed from the other departments to cause them no pain.” (Prof. L. H. Stringer, the Bulletin, Dec. 1948) When the Department of Music moved into the Daland Fine Arts Center, The president’s home/studio became the Administration Building. The room in the Gent’s Hall used for athletics proved inadequate, and the Class of 1909 made a gift of $1,000 toward a gymnasium, which generated pledges of $8,000 in support of the project. The building, which cost of $22,000 was finished in 1911 and served as both gymnasium and auditorium. 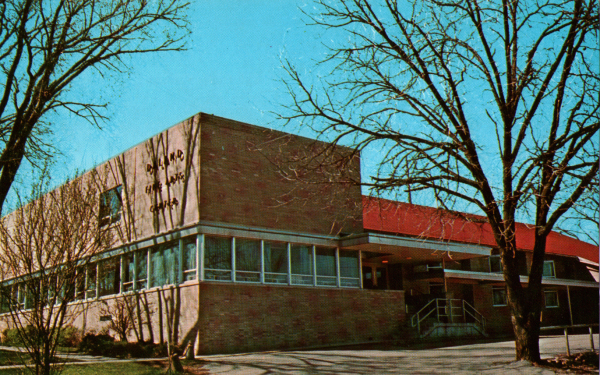 A wing was added to the old gymnasium in 1962 to accommodate the music department which had out grown the studio, and the gymnasium itself was remodeled into the Allen-Bradley Auditorium. The building was dedicated as the Daland Fine Arts Center to the memory of President William C. Daland, Dean John N. Daland and the Daland family. 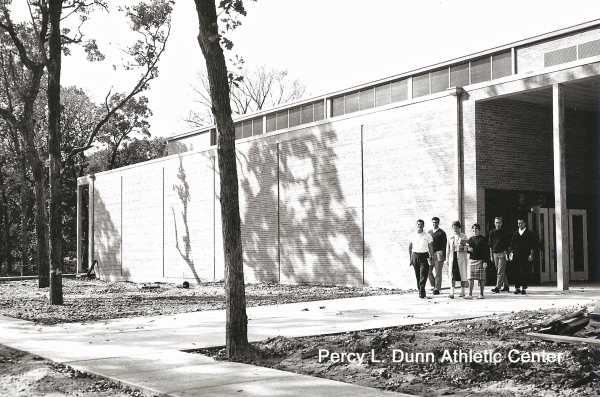 The Percy L. Dunn Athletic Center (the old gym) was completed in 1960 at a cost of $250,000.